The Iso Max Extractor Fan are totally unique tube style fans, designed to be efficient, powerful and yet quiet in operation. Iso-Max uses the stator-rotor system that enables it to be efficient both in air performance and power consumption. Iso-Max are unique in that they are both a fan and an integrated silencer. 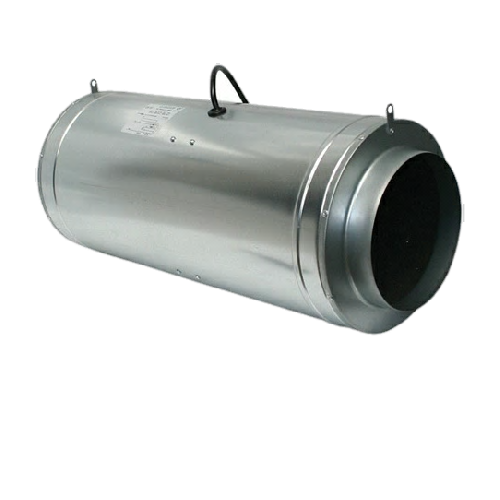 It has a full metal housing and for noise-reduction a special type of foam is added, Its low weight, strong air performance and quietness makes Iso-Max the most advanced choice for a grow room ventilation. Iso-Max Fans utilise the low energy and high performance motor of the Ruck Etaline fan series. These motors are capable of delivering large volumes of air, even when carbon filters and complicated ducing systems are installed. Built around aerodynamic efficiency, the Etaline motor is situated inside a sealed, acoustically designed, silenced housing. This not only insulates the noise from the motor and air movement, but also provides hanging points at either end for easy mounting. The overall result is a surprisingly lightweight and powerful fan that keeps noise to a minimum. The Iso-Max 150 & 200 both have an integrated 3 speed controller.